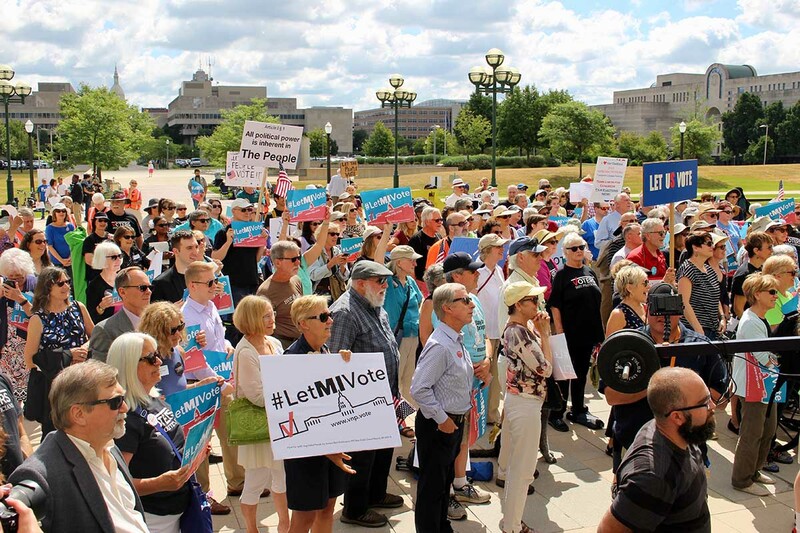 The grassroots organizing group Voters Not Politicians convinced justices that voters should have the right to decide in November whether to create an independent commission to draw legislative districts in Michigan. If passed, the initiative would replace the current practice in Michigan of allowing the political party in charge to make those decisions every 10 years. Michigan voters will decide this November whether the state needs an independent commission to draw legislative districts, following a Michigan Supreme Court decision late Tuesday allowing the measure to stay on the ballot. In a 4-3 decision, Michigan’s highest court ruled that the Voters Not Politicians ballot proposal was appropriate to go before voters. Challengers to the initiative had argued the measure was too broad and could only be enacted by constitutional convention. The two justices nominated or appointed by Democrats were joined by two justices appointed or nominated by Republicans to uphold a Michigan Court of Appeals ruling allowing the ballot measure to go forward. Voting to take the proposal off the ballot were three Republican-backed justices on the GOP-dominated court. The partisan makeup of the state Supreme Court was considered a possible issue because the proposal has been largely opposed by Republican power brokers in the state while favored by many Democrats. “We are stewards of the people and must faithfully abide by the decision they make through the laws they adopt,” David Viviano, a Republican-backed justice, wrote in the majority opinion. Viviano was joined in the majority by fellow Republican Justice Elizabeth Clement and Democratic backed justices Richard Bernstein and Bridget Mary McCormack. In opposition were Republicans Kurtis Wilder, Brian Zahra and Chief Justice Stephen Markman. The Supreme Court ruling is the end of the road for legal challenges to the ballot proposal, with opponents and supporters now expected to turn to a heated and expensive campaign pitched at Michigan voters leading up to the November election. Currently, Michigan legislators redraw district lines every 10 years following the U.S. Census, with the most recent boundaries drawn by Republican consultants in 2011. Whichever party is in power during that process can greatly influence how those lines are drawn, which has led to accusations of partisan gerrymandering. If approved by voters in November, the ballot initiative would change the system to create an independent, 13-person board of citizens responsible for drawing the lines with the help of consultants including computer experts, and subject to public hearings. The commission would be composed of registered Michigan voters and include four members who identify as Democrat, four who identify as Republican and five members who don’t identity as belonging to either major party. The high-stakes case was being watched closely by political parties and activists in Michigan and across the nation. Democrats in Michigan tend to back redistricting reform, noting that statewide voting totals in recent elections have been relatively equal between Democrats and Republicans, and yet in state House and, particularly, Senate races, the GOP has reaped huge electoral advantages. Bridge wrote about recently emerged emails written by Republican consultants and a then-Michigan Chamber executive in 2011 which indicated that nakedly partisan decisions were being made in the drawing of congressional districts to favor Republicans. Republicans, in turn, have raised skepticism about Voters Not Politicians’ proposal, which they suggest is a veiled effort to shift political power to Democrats in drawing boundary lines. The petition was challenged by Citizens Protecting Michigan’s Constitution, which contends the Voters Not Politicians proposal would too broadly change the state constitution and doesn’t properly specify those changes in its petition language. The Michigan Chamber of Commerce and Attorney General Bill Schuette, the GOP frontrunner for governor in November, also oppose the ballot proposal. The chamber has heavily financed the legal challenged to the ballot measure as well as the campaigns of Republican-backed candidates for the Supreme Court. yeeha! start to restore democracy vote yes. I think those emails turned the tide on this issue, otherwise I was expecting the court ruling to go the other way. The opposition to this is going to have a hard time building a case to vote against it since the emails are of course going to be a part of the campaign to vote in favor of it and what kind of a response are you going to have to that? What concerns me is who picks the independent members? How are they chosen? Are they deemed independent based on their voting, or what they declare themselves? Are they chosen randomly? Are they chosen or not chosen by what they have said in social media comments or even Bridge comments? I argue that there is no such thing as an independent person. I have voted for democrats, republicans, and non-partisian people, yet if you asked me I would say that my political leanings are a lot to the right of Attila the Hun. I have voted in both, at different times, Democrat and Republican primaries. Will the members of the committee have to pass some form of intelligence test, or where do you live test, or what gender or race or ethnic background test? I just don’t know, and when I don’t know I assume the worst. In this case I see it as not an effort to drain the swamp, but to replace the swamp with a different flavor of swamp water. My solution. Take people out of the equation. Design a computer program acceptable to both parties and let it draw the boundaries. Computers do what they are told repeatedly and accurately and without partisan interference. And lest anyone say that the term acceptable to both parties could be used to slant the vote, I would say that the vote is only acceptable if the majority of both parties vote for it. Thus if the legislature was 80% democrats and 20% republican, then 41% of democrats AND 11% of republicans would have to vote that the rules were acceptable. Once in a while, yes, WE THE PEOPLE do win. Candidates should have to listen to all voters and constituents in their district, whether state or federal. A vote shouldn't be assured simply because you are a Republican in a district gerrymandered for you or vice versa. It is an exhilarating feeling. It is alarming that the decision was not unanimous, particularly given the fact that a fairly conservative Court of Appeals panel had no difficulty in flatly rejecting all of the Plaintiff's arguments. The 1963 constitution was unambiguous -- it established an independent commission that expressly barred legislators from participating in drawing district lines or from running for state office in the first election after the new lines were put in place. Four justices recognized that Voters Not Politicians' proposal merely restored the independence of the commission and its exclusion of legislators from the redistricting process, and was therefore a proper amendment to the constitution. The Michigan Constitution begins with the words, "All political power is inherent in the people." This language makes it clear that the constitution should be interpreted in favor of citizen initiatives to amend the constitution. This should not have been a close case. Voters should remember the names of the three justices who voted against democracy and citizen engagement in our government, and be grateful for those four who rose above partisan rancor to do the right thing. I am Proud of the Justices that voted for the people although the vote should have been 7 affirmatives in favor. That vote showed that there is much to be done in the November election. People get out and vote your conscience to help right the wrongs of the last 8 years that the newly elected officials will act with their constituents needs and wants in mind - not business as it has wrongly been. Thank you SC of MI. Too often the voters have been prevented from exercising their vote by this Republican legislature: minimum wage; right to work; emergency mangers. Vote yes! Great.. Just what we need, unelected (these will be appts) bureaucrats running the show. No way to hold them accountable if its a mess. Scary. Proposal 2 is reasonably considered racist. Why are families of elected officials disqualified? If we can't have families of elected officials qualify, then why not disqualify all government workers, including teachers and the military? This is discrimination. Why isn't the application and the process to determine which applications are qualified published? Why isn't the training each of the selected people will receive published? Who is going to make certain the consultants they can hire are not biased? What happens if they can't agree on the district maps, do they have permanent jobs for the next 10 to 30 years earning "at least 25% of the governors salary?" Are these intended to be full time positions? Will the only people who qualify be people without jobs? Do we really want people who can't hold a job redistricting? If the districts are more competitive, then we lose seniority in the US Congress more often. This is just a bad piece of legislation.